“Jeju is a scenic haven for romantic poets.” according to Mr. Kang Moon Gyu, the head of the Institute of Ecology and Culture for Mt. Halla. How apt! During spring, the island is a patchwork of vibrant colours. Below are some festivals you can enjoy on Jeju island in spring. 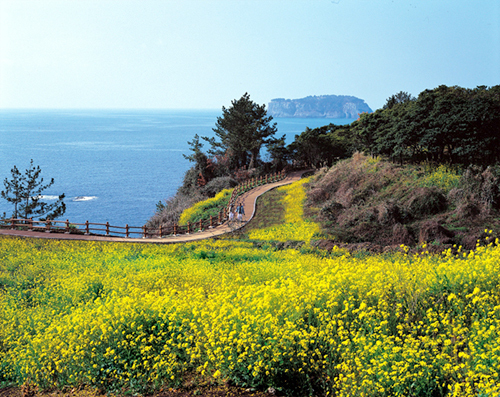 The Jeju Canola Flower Festival is held annually at Gasi-ri, Seogwipo. These lovely bright yellow flowers attract large numbers of tourists year after year. The Udo Conch Festival has a variety of activities. Visitors can watch conch shell musical shows, traditional crafts and sample buckwheat pancakes (bingtteok), rice porridge (juk), seaweed, peanuts and mugwort soap. The Mt. Halla Clean Bracken Festival is held at Sumang Farm, Namwon-eup, Seogwipo. The plant Bracken (gosari) was used in the past as a tribute to the king. These days, it is used as a bibimbap ingredient. Various activities include bracken picking and culinary events. The Gapado Barley Festival is held on Gapado, a small islet in Jeju. Programs include barley field marathon, Olle route, couple bicycle activities, kite flying and sampling traditional food. The Cherry Blossom Festival is held at Jeju Public Sports Stadium, Seogwipo. The King Cherry Tree blossoms are the most luxurious among all the cherry blossoms and is popular with both locals and tourists alike. Don’t miss having a romantic stroll along the beautiful cherry blossom boulevard.